Fabric Dyeing is to dye for! I’ve been playing with dyeing my own fabrics for the past couple of years. Some yardage turns out better than others. Regardless, I have found that ALL the resulting fabric is usable. You just have to find the right project. If you haven’t ever tried fabric dyeing, give it a shot. There is a bit of an initial investment (dyes, chemicals, cheap measuring cups and spoons), but the results are well worth it. The first ingredient necessary for dyeing is the recipe. By far my favorite source for recipes is Color by Accident: Lower-Water Immersion Dyeing by Ann Johnston. I have so much fun making the recipes in this book. Ann provides material lists, explanations, everything you need to get started. Just make sure you have room to store all the resulting fabric! I like to buy my fiber reactive dyes from Dharma Trading. Go this route only if you think you want to get into dyeing big time, the amounts of dyes you have to buy are more than what one initial project needs. You can get supplies to do a smaller single project by buying your supplies at an art store in your area. I easily found two places in the QuiltWoman.com locale that sold smaller amounts. You also need fabric. You can buy PFD (prepared for dyeing) fabric from your local quilt store, from a place like Dharma Trading, or you can scour your own. It’s up to you how much time, effort and money you want to put forth. There are loads of dyeing tutorials out on the web. Just do a Google search for “fabric dyeing” and you’ll find them. Someday I’ll post the steps (with messy pictures) I take when dyeing fabric. But for now I want to surge ahead and show you some of the end results. This wall hanging is called Northern Sunflower. 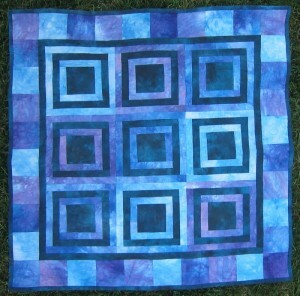 The pattern is one of the first QuiltWoman.com patterns I made. It is designed by Barbara Skjønberg, a resident of Norway and one of our long-distance designers. I’ve always loved her patterns and fell in love with this the first time I saw it. Click on the image to get a closer view of the fabrics. The fabrics were all hand-dyed by myself and my 16 year old daughter (more on her involvement in fabric dyeing in the next paragraph). A lot of my fabrics in this wall hanging were dyed as experiments, especially the petals on the flowers, I really didn’t have any idea of what project to use them in. Heck, sometimes it was enough to just have dyed fabric lying around to admire. But the fabrics worked out great in this beauty, if I do say so myself! Dyeing is pretty simple, as evidenced by the fact that my teenage daughter did some of the fabrics in the Northern Sunflowers wall hanging. 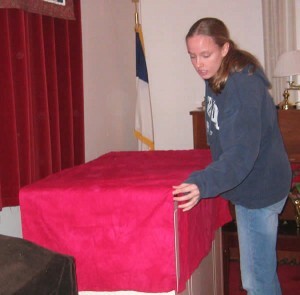 She was earning her Girl Scout Gold Award by making color specific table covers for the school rooms at our church. She dyed 50 yards of fabric one VERY long weekend. The result…the church school rooms look great, my daughter got her Gold Award and I got the scraps and thus my beautiful wall hanging! This is another hand dyed wall hanging I made. I had saved the picture of the quilt from a magazine a long time ago. For this one, I attempted to hand dye the fabrics to the shades I wanted. I succeeded on 90% of the fabric. But the dark blue was not dark enough. I ended up over-dyeing that fabric with black. Phew, it worked. I love the result. Writing this blog has inspired me to put together another project using my hand-dyed stash. How about one of these? This first one is again by Barbara Skjønberg and is called Northern Flower Garden. Or how about this one! This is Atlantis and was conceived by our Australian designer, Lisa Walton. I think either of these two patterns would be great candidates for hand dyed fabrics. It’s time to wrap this blog up. My creative juices are flowing and I need to get to my sewing room! I’ve got a stash of hand dyed fabrics just waiting for me! 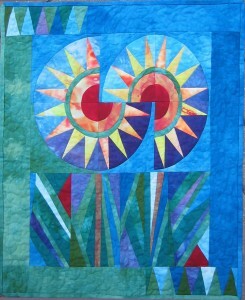 This entry was posted in Fabric, patterns and tagged Barbara Skjoenberg, Fabric Dying, Lisa Walton. Bookmark the permalink.